Camping equipment and vehicles can take a beating when you are on the go. Dust, dirt, rain, and wind can wreak havoc on your gear, but it’s easy to protect it and keep it looking new with just a few simple steps. Before you hit the trails, make sure to protect your vehicle and camping gear from the elements. To help prevent fading and cracking of surfaces that can result from exposure to the sun’s powerful UV rays, treat your equipment with a product like 303® Aerospace Protectant™. The protectant has an anti-static property that repels smudges, dust, soiling, and staining, and it is safe for use on kayaks, paddles, decals, RV slide-out seals, bike/ATV seats, handlebars and much more. It also works on items you may not think about, including life jackets, picnic tables, coolers, tackle boxes, fishing poles and even the grill! To strengthen and restore water repellency, which increases your fabric’s ability to repel dirt and stains, try 303® Fabric Guard™. 303 Fabric Guard is safe to use on any synthetic and natural fibers, and it’s perfect for protecting tents and duffel bags. Basically, it helps keep the water out leaving you AND your gear dry. Hiking and camping can be a bit messy, but don’t worry. Keep a cleaner like 303® Multi-Surface Cleaner™ on hand to help remove stubborn coffee stains, oil, grease and ink from virtually any surface. It is ideal for cleaning vehicle interiors to RV awnings to car covers. And it is safe to use on vinyl and fabric anywhere in your car, motorhome, or other places in need of cleaning. 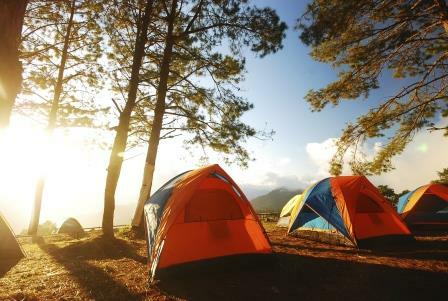 Safe trails and happy camping!